Is it Possible to Prevent a Tsunami? Once a tsunami has been formed, there is no way to stop it; but with an effective warning system in place, people can be evacuated. And reducing the damage caused by a tsunami is certainly achievable. 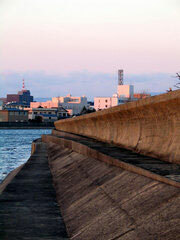 Tsunami walls, flood gates, and channels are three measures that can be taken to that end. Japan is prone to tsunamis and has built numerous tsunami walls along the coast of heavily populated areas. The tsunami walls are designed to absorb some of the energy of the tsunami and redirect some of the water back towards the open ocean. The walls may be as high as 14 feet (see picture below). Flood gates and channels can help redirect some of the incoming water from a tsunami, but a large tsunami will easily overwhelm any of the measures that are used to reduce its strength.